We’ll crunch the numbers and measure the stats about your guest and operations. You’ll visualize the data to focus on increasing revenues and spending. serVme’s direct integration with key systems allows data to be funneled in to one centralized CRM platform This rich data is presented in dynamic charts and easy-to-read diagrams providing insights on your operational performance and sales at a glance! To ensure data is at the fingertips of decision makers and operators, we automatically generate and send reports to track real-time performance across several venues. Your staff will always be updated on the outlet’s performance. 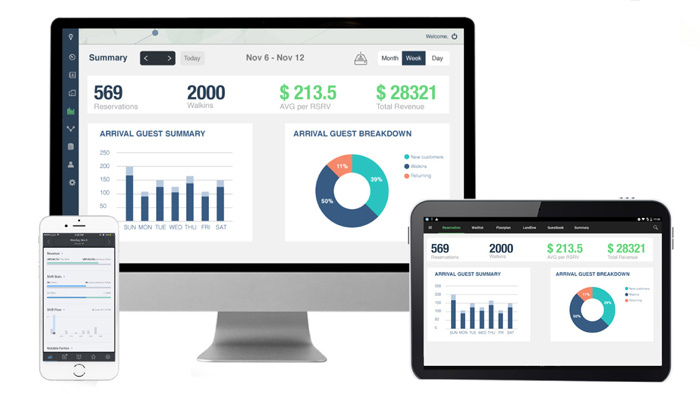 Access numerous insightful reports segmented by outlet or group or customize the report that suits your operational needs to better understand how to service guests. Our standard reports span from to understanding outlet performance to guest spending habits. Compare the performance of your venues, brands, and hotel properties across different segments and revenue streams. Optimize your business by viewing our easy to read dashboards powered with guest specific insights to better service your customers in a more effective manner. Access and measure real-time metrics about your operations across multiple locations worldwide from the palm of your hand. Understanding your guests allows you to turn around the business in a faster manner to address your customer needs and rapid market changes. Increase the guest average check and customer return visits by using the data insights to ignite your revenues.